ALVI has spent much time and thought on the topic of "ideal sleeping environs" to further support baby’s healthy sleep. A special focus was the danger of " overheating". The sleeping bag Baby-Mäxchen includes an inner and an outside bag. 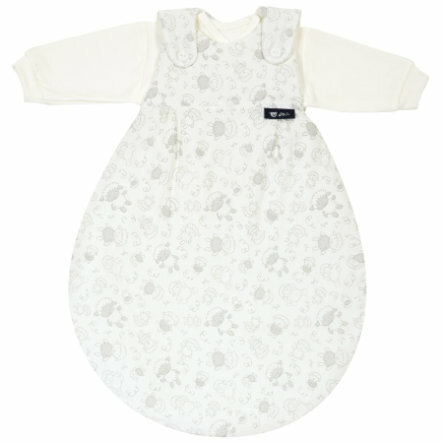 The inner bag is made of 100% cotton and has long sleeves, soft knit cuffs and can also be used as a summer sleeping bag. The outside bag is made of cotton jersey. Its size can be adjusted to your baby’s growth. The bag has a long service life, as it can be used already shortly after birth. The pear like shape of the bag provides much room for your child. The all-round zipper minimizes the danger of injury from the zipper!